More Stuff > What is a Hybrid? 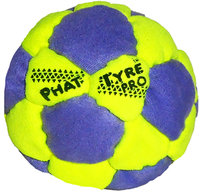 Hi everybody, Jim here at Flying Clipper introducing you to our Tossaball Hybrid juggle balls. Many jugglers ask me what is a Hybrid juggle ball? 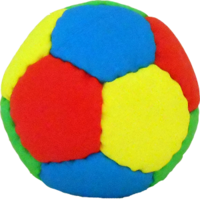 And I say this:The Hybrid juggle ball is a hand sewn ball that uses two very different filler materials which do not co-mingle, that is to say that one filler material is isolated from the other. 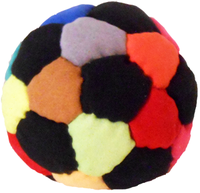 The Tossaball Hybrid juggle ball looks like an ordinary pentagonal dodecahedron but actually each pentagon has another pentagon sewn flat against it. Just before each pentagon is completely sewn into the ball, a weighed amount of heavy crushed rock filler is added between the panels and then it is sewn shut. A pentagonal dodecahedron is made up of twelve pentagons which are exactly the same size and that uniformity enables us to achieve a balanced weight ratio within each pentagon. Crushed rock being heavier than plastic pellets insures that most of the balls weight is isolated to the outside edge of the ball. The interior of the ball is then filled to volume with recycled plastic pellets. Some interesting things occur when so much weight is isolated to the outside of a sphere. Jugglers have called it “true flight” which translates into predictable flight. Because of the weighted rim, Hybrid juggle balls go up and down like no other balls before. As all good jugglers know, any small improvement in the performance of your prop can make a big over-all difference in a juggling experience for both the juggler and the audience. Another attribute of these fine juggling balls is absorption of shock. When Hybrid juggle balls collide, the shock is absorbed rather than radiated. Crushed rock against crushed rock tends to absorb shock and not reflect shock. Collisions become less troublesome and the balls do not tend to roll when dropped because of the absorption tendencies of crushed rock. 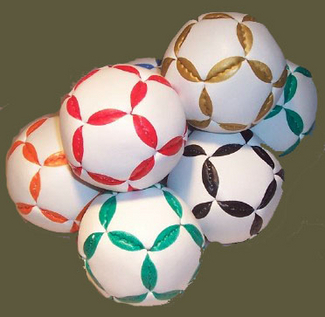 Still another fine characteristic of Hybrid juggling balls is two layers of fabric used in the construction. Double layers of fabric result in double strength in regards to the shell of the ball and less stretch over each panel of the ball as two layers act as a bias. Because of the isolated weight to the rim of the ball, you will never find a hand sewn juggling ball that rolls and stalls like a Tossaball Hybrid juggle ball. And lastly if all of this was not enough, Tossaball Hybrid juggle balls are completely washable. Hybrid juggle balls were first introduced in fall of 2008 at the Portland juggle Festival and I have been continually perfecting them since that time. I draw from my own experience and I listen to what the jugglers tell me. I have personally hand sewn more than 50,000 footbags and 25,000 juggle balls in my career as a craftsman which has spanned more than 31 years. Regrettably, because of repetitive motion problems in my arms and shoulders, I can no longer do the craft that I love. 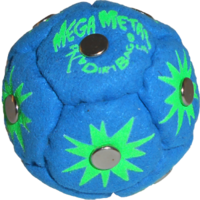 As a way of re-inventing myself and the craft, I began to dabble in the physics of juggle ball design which has lead to the development of what I think is a great line-up of high quality juggle balls. Lastly the term "Hybrid" came about because this new way to hand sew a ball is our attempt to "cross over" as it were to a new line-up of hands and feet juggling balls which is our ultimate goal. We are not there yet but we think in the future more and more jugglers will be using all four limbs to manipulate objects into the air. Hats off to good friends like Peter Irish who has shown us the way. Flying Clipper's Hybrid Juggling Balls and Hybrid Footbags utilize two separate fillers to create a totally washable, high-performing product for professional juggling or footbagging.